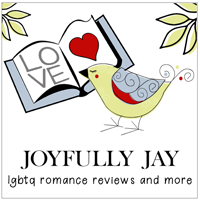 Jeff and Will announce that they’ve been selected, for a second year, to be part of the GayRomLit featured bloggers. The first GRL Blog Tour spot will appear in episode 91 on July 3. Kenneth is congratulated as the winner of the recent Sweet Summer Fun Paperback Giveaway. New patrons Lu Ann, Megan and A.E. were welcomed. The guys review Fixing Frank, book three in the California Comedy series, by Jason T. Gaffney and Ed Gaffney and presented under the Suzanne Brockmann Presents banner. Then they welcome Suzanne, Ed and Jason for part one of an interview where they talk about Suzanne’s history of writing m/m characters going back to the mid-2000s in her Troubleshooters series and the collaboration that lead to the California Comedy series. Remember, you can listen and subscribe to the podcast anytime on Apple Podcasts, Google Play Music, Stitcher, PlayerFM, YouTube and audio file download. Thank you Jeff & Will for having us on the show! It was such a honor and really fun to get to talk with you both! Hello from TPA! Thank you, Jeff & Will both for the great review of FIXING FRANK, and for hosting our noisy family on your wonderful podcast!! Thanks for having us on your cool podcast, Jeff and Will. It was great meeting you guys, and getting a chance to talk to you! Jason, Suzanne, Ed, it was a blast having all of you on. Learning all about your creative family was truly a pleasure. I have always been a huge Suzanne Brockmann fan but lost track in my reading drought of 2014-2016. But I’m back now! I love Suzanne Brockmann’s stories & look forward to reading Jason/Ed’s as well. Thanks for the great podcast. Thanks, Lisa! I love the Big Gay Fiction Podcast, so it was hugely fun to visit with Jeff and Will! Glad you enjoyed the show, Lisa! It was such fan talking with Suz, Jason and Ed. Thanks, Lisa. It was a blast! Hope you enjoy Fixing Frank! So great to see you here! Isn’t the BGFPodcast awesome? I love watching/listening!! Glad you enjoyed the interview, Pat. Next week’s part 2 is equally fun. Suz: We’ve known Pat on Facebook for sometime now, but finally got to meet her at RT and that was terrific!